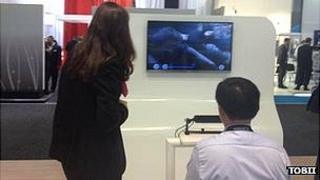 An eye-controlled television has been unveiled at Berlin's IFA trade show. Haier's Gaze TV uses technology developed by Tobii, a Swedish firm which already offers eye-tracking technology for computers. Users control the set by staring at the top or bottom of the screen to activate a user-interface. The technology is still at prototype stage and prone to glitches, but it has the potential to offer an alternative to the traditional remote control. Existing smart TV's also offer hand gesture and voice controls as alternatives, but again the functions can be hit-and-miss in real-world use. The key part of Tobii's technology is not built into the television set itself at this stage. Instead an attached sensor sits in-between the viewer and screen monitoring the person's eye movements. By tracking the shift in gaze and blinks given it allows the user to point, zoom, scroll, select and navigate menus and features. The device has to be calibrated to each user before use and becomes less accurate if they are wearing glasses. But its developers say they think it has the potential to offer a more natural way to control TVs and other devices, and are hoping to partner with more manufacturers. "The free Tobii Gaze Interaction software development kit is available to companies interested in exploring the possibilities of gaze interaction and using this revolutionary technology to develop gaze applications that will take part in the future of computing and consumer electronics," said Tobii's chief executive Henrik Eskilsson. Tobii originally developed its products to help disabled people control computers. Its sensors and software currently cost thousands of pounds to purchase, which have prevented their widespread adoption. But over recent months the firm has been showing off concept designs for gaze-controlled car information systems, surgery room image display screens, and video games. PC-maker Lenovo has also created a concept laptop with the technology built-in which scrolls through text documents, keeping pace with the user as they look through a document. Tobii says it hopes to have its first consumer-focused product on the market by 2013. For its part, Haier is developing a reputation for showing off futuristic concept designs. The Chinese company unveiled a "completely wireless" TV at Las Vegas' Consumer Electronics Show in January. It used a separate power transmitting coil to send it energy using magnetic resonance technology, and the high-speed WHDI (wireless home digital interface) format to beam it video and sound.